Ella Mae Morse (September 12, 1924 – October 16, 1999) was an American popular singer. She was hired by Jimmy Dorsey when she was 14 years old. 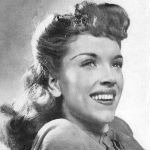 In 1942, at the age of 17, she joined Freddie Slack’s band, with whom in the same year she recorded “Cow Cow Boogie”, the first gold record by Capitol Records. “Mr. Five by Five” was also recorded by Morse with Slack, and they had a hit recording with the song in 1942. She also originated the wartime hit “Milkman, Keep Those Bottles Quiet”, which was later popularized by Nancy Walker in the film, Broadway Rhythm. In 1943, Morse began to record solo. She reached #1 in the R&B chart with “Shoo-Shoo Baby” in December for two weeks. In the same year she performed “Cow Cow Boogie” in the film Reveille with Beverly and starred in Universal’s South of Dixie and The Ghost Catchers with Olsen and Johnson and How Do You Dooo? with radio’s Mad Russian, Bert Gordon. The song “Love Me or Leave Me” as recorded by Morse was released by Capitol Records as catalog number 1922, with the flip side “Blacksmith Blues”, which became her biggest hit.